This sandhills town of 1800 people sits at the center of the seven county region called, The Nebraska Outback. There is a wealth of activities in this area with excellent bed and breakfasts and motels, and many immaculate RV hookups for your stay in Ainsworth. After your daily excursions, Ainsworth will welcome you back to town for fine dining, relaxation or mini-antique, bike or shopping tours. Ainsworth sits in the middle of ranch and cowboy country. We know how to work and play hard. Our community hosted the Cattlemen's Ball and World Horseshoe Tournament in 1998. Ainsworth's National Country Music Festival is approaching 30 years of outstanding country music, auctioneering, dancing and wholesome family entertainment. 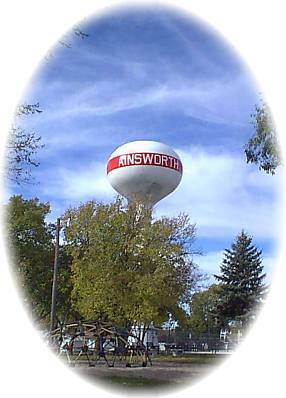 Ainsworth is named for Captain James E. Ainsworth, chief construction engineer of the Fremont, Elkhorn and Missouri Valley Railroad, who arrived at the town site in June 1882. Pioneers were pushing west, setting up shops and businesses. Many also filed for homesteads on the free land. The new town had all the ingredients to grow. And it did! By 1885 the town covered nearly 30 blocks, and Main Street was crowded with shops. For several years before and after 1880, this region was the scene of great tragedy due to the struggle between gangs of horse thieves and the vigilantes. "Doc" Middleton, leader of the most notorious horse thief gang, was captured and sent to prison in 1879. "Kid" Wade, the most famous of Middleton's followers, had eluded the officers for many months; but he was finally captured and hanged by a lynching party at Bassett, just east of Ainsworth. In 1879 Nannie J. Osborne, a cook and housekeeper, arrived on horseback by way of Fort Hartsuff. She also filed for a land patent and received title to 160 acres in 1883. Located along the railroad, she platted it into lots and provided building sites for the United Methodist Church and the First Congregational Church. Morris Skinner, our nationally known paleontologist, roamed the canyons in this area. When he was 17, he and Tim Quinn found a Mastodon skeleton and sold it to the Museum of Natural History in Denver. That paid for their summer labors and Morris went on to the University of Nebraska graduating in 1932. The American Museum of Natural History in New York offered him a job during the Depression. His work is still being studied by paleontologists all over the world. His studies of stratophology, (mapping different layers of earth where the fossils were found, which determined the age of the animal) are continued today. Morris died in 1989, his wife, Marie, is still living in Ainsworth and carrying on his legacy. In 1991, the village of Johnstown was the site of filming for the CBS Hallmark Hall of Fame movie, "O Pioneers!" Viewing the old fashioned main street with board sidewalk is a trip down memory lane with a unique "Old West" appearance.